In Brookline, Massachusetts, former governor Michael Dukakis recently invited folks to bring their unwanted turkey carcasses to his house, so Dukakis (or rather, DuCarcass?) could save them and make soup out of them. That may be charming and resourceful, but in New York, there’s something bigger and better brewing. It’s called Transfernation, a non-profit founded in 2013 by current NYU seniors Samir Goel and Hannah Dehradunwala. 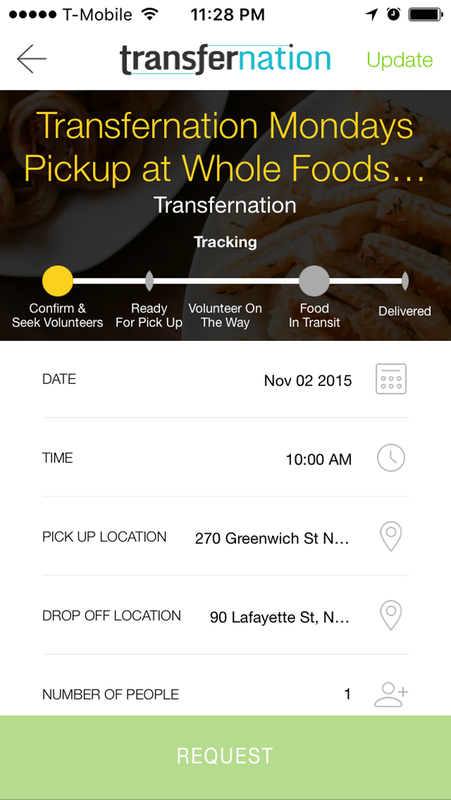 Operating as an online and mobile app via SocialEffort, Transfernation works to connect organizations, such as corporations with excess food left over from events, with shelters and food banks. Similar to Uber or Lyft, one party with food to give inputs details and location, they are matched with a nearby site to receive the food, volunteers are sourced, and the food makes its journey. Since its founding two years ago, the 510(c)3 non-profit has rescued over 10,000 pounds of food in the Manhattan area. Transfernation, which currently has a staff of three plus interns and relies heavily on volunteers, is gearing up to launch a fundraising campaign for the month of December, beginning on popular philanthropy date #GivingTuesday (December 1). This campaign will aid in its operations and expansion plan; the endeavor is currently based primarily out of Manhattan but hopes to expand to the outer boroughs and eventually exist nationally. Given that 2.6 million New Yorkers have trouble affording food and yet NYC restaurants generate a half million tons of food waste per year, Transfernation feels like a breath of fresh air in a city full of extremes and income gaps that just seem to be getting wider. Goel, who has spent time in India, and Dehradunwala, who grew up in Pakistan and Saudi Arabia, felt struck by poverty they witnessed both in New York and in other countries. Their shared passion for food and food justice combined with an NYU business plan competition first brought their idea to life. A particular game-changer was when they were doing research and learned the amount of food wasted was so vast that distributing it alone could end hunger. “It was just like, duh. Why don’t we bring that extra food to people who need it?” Goel says. While there are other “food rescue” organizations in NYC, Transfernation is unique in that it is less strict about what it will accept. “A lot of people have this huge fear of liability, especially in New York. There’s both federal and state statutes that put the standard of liability as ‘knowingly unfit for human consumption.’ But food from an event, you would take that home for your family, it’s very commonly understood that that’s acceptable. So there’s actually not the liability people think there is,” says Goel. “The big thing [for us] is figuring out how long the food has been out. So we ask our partners to tell us that when we pick it up, and then we’ll bring it to a shelter and we’ll notify them. And at that point it’s at their discretion. We don’t really have that expertise.” This liability concern made it an initial challenge to procure partners, but once they garnered the support of popular brands like Indeed and InstaCart, they gained reputability and subsequently found it easier to bring more companies on board. Transfernation works with various social organizations, including homeless shelters such as The Bowery Mission and Chinatown’s NYC Rescue Mission, as well as food banks and pantries. Since different organizations have varying capacities of food storage (refrigerators, freezers, etc), Transfernation determines which place gets which type of food based on these factors, rescuing hot prepared food as well as groceries. “The best part about it, and I think one of the reasons volunteers love working with us, is you get to see who you help. They’re so happy and so grateful, that experience is just really incredibly gratifying,” Goel says. Companies interested in partnering with Transfernation can begin the process by downloading the app SocialEffort and making a ‘Facilitator’ account. People interested in volunteering with Transfernation can go here. Find their fundraising page here. Correction: An earlier version of this post was revised to correct the spelling of Michael Dukakis’s first name.